In the centre of Baku’s downtown, an unfinished five-star hotel sits locked and empty, a ghostly shell completely dark at night except for the glowing white letters at its elegant, sail-shaped peak: Trump Tower. 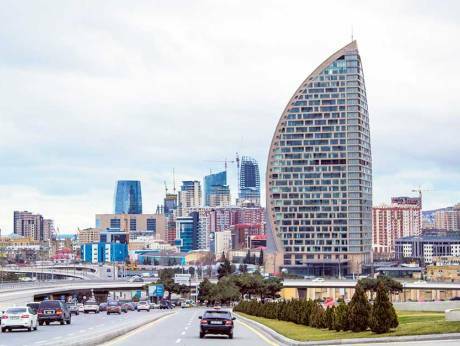 Construction on the Trump International Hotel & Tower here in Azerbaijan’s capital stopped last year when the country’s oil-driven economy crashed amid plummeting oil prices. The local owner and developer, facing potentially huge losses, is scrambling to renegotiate contracts and get the building open. But Donald Trump, who invested virtually no money in the project while selling the rights to use his name and holding the contract to manage the property, has made millions. The presidential nominee reported $2.5 million in income from the project between January 2014 and July 2015 and an additional $323,000 in management fees in the months since, according to his financial disclosure report. If elected, Trump would be the first US president to preside over a global business empire, one that includes seven resorts, hotels and other projects in foreign countries, 11 more under construction and plans for many more. Among them are properties in nations where the US has important economic and national security concerns — such as Turkey, Indonesia, the UAE and Azerbaijan — that could put Trump’s personal business interests on a collision course with the duty of a president to act solely in the best interest of the US. Here, in an oil-producing nation wedged between Russia and Iran on the strategically important Caspian Sea, Trump has partnered with a young billionaire, Anar Mammadov, whose family is part of a longtime ruling regime that the US State Department and others say is plagued by endemic corruption and human rights abuses. Much of Mammadov’s fortune has come from construction contracts awarded through the Transportation Ministry run by his father. Trump’s contract includes licensing his name and managing the hotel if it ultimately opens. Critics of the Azerbaijani regime see Mammadov’s role as a tacit approval from the government, and they argue that the future success of the property hinges in part on good relations with the country’s top officials. Trump has not said precisely how he would separate his personal financial interests overseas from his administration’s policies. But his general counsel, Alan Garten, said Trump and his company would take steps to ensure that there would be no conflicts of interest if he were elected. Garten said that Trump’s organisation did extensive due diligence on Mammadov before it signed its deal for the hotel project in 2012 and that its investigation did not raise any red flags. Asked to review several news reports raising questions about the sources of Mammadov’s wealth, Garten noted they were all from 2013 and 2014. “All of this came to light after the deal had been signed,” he said. Critics say Trump, if elected, would face challenges here in drawing a distinction between the interests of his business and those of his country. Azerbaijan has been dominated for decades, stretching back to the 1960s Soviet Union era, by the Aliyev family, which, according to the State Department and human rights groups, has a poor record on human rights and free speech, including the jailing of journalists who investigate it. “It’s a mafia,” said Ganimat Zahid, editor of an opposition newspaper, Azadliq, who lives in exile in Paris after being jailed in Azerbaijan for 2 1/2 years on what rights groups called bogus assault charges. Zahid said Trump’s partnership with Mammadov was deeply troubling but probably a shrewd business move by Trump. Rebecca Vincent, a London-based human rights activist and former US diplomat at the US Embassy in Baku, the capital, described Trump’s business interests here as a clear conflict for a US president. Trump’s entry into Azerbaijan came as the country was actively positioning itself as a pro-Western counterweight to Tehran and Moscow, supporting US-led counterterrorism efforts and contributing troops to US democracy-building efforts in Iraq and Afghanistan. It is also a major oil- and gas-producing nation and a crucial link in the $45 billion Southern Gas Corridor, a 2,100-mile pipeline from Baku to Italy that will bring Caspian Sea gas to Europe. Mammadov, a fluent English speaker who is comfortable in Europe and the United States, also was emerging as the fresh face his country needed to project modernity and vitality to the world. He became the founder of the Azerbaijan America Alliance, which blew into Washington in 2011 like a hurricane of cash. In the next four years, the alliance spent more than $12 million lobbying, records show, wining and dining Washington policymakers in an effort that Baku’s critics called “caviar diplomacy”. To Trump, Azerbaijan looked ripe for a business deal. Garten, Trump’s attorney, said Trump was approached by “an intermediary known to both sides” to propose the hotel deal with Mammadov’s company, but he said he could not remember that person’s name. The licensing agreement between Trump and Mammadov’s company, Garant Holding, was signed on May 25, 2012, Garten said. The project would not be publicly announced for two years. When Trump announced his hotel deal with Mammadov in 2014, Baku was a blazing centre of development. Across the modern seafront city, buildings were popping up as fast as developers could build them, all driven by sky-high oil prices that just kept rising. Concerts in Baku by pop stars Jennifer Lopez, Rihanna and others had helped solidify the image of a US-friendly nation eager to annoy the Iranian mullahs just across the Caspian. In his announcement, Trump said that Garant Holding would build and own the sail-shaped tower with 72 “ultra-luxury residences” and 189 hotel rooms. Trump would license his name to the project, which had been under construction for several years, and eventually his organisation would manage the hotel. “When we open in 2015, visitors and residents will experience a luxurious property unlike anything else in Baku — it will be among the finest in the world,” Trump said in the 2014 news release. During a visit to the building site, Trump’s daughter Ivanka gushed that the building “reflects the highest level of luxury and refinement. We are looking forward to bringing our unparalleled Trump services and amenities to Azerbaijan,” she said. The Baku hotel went up on the Trump website. The 2015 opening was promised. In December, the hotel disappeared from the Trump site. Today, a couple of security guards and a sleepy caretaker keep an eye on the place, which is overgrown with weeds. A huge globe that says “TRUMP” sits in a fountain filled with sand and litter, near the locked-up front entrance. “We have had an interruption in the construction,” Khalid Karimli, chief financial officer for Garant Holding, said in an interview at his company’s Baku headquarters. Karimli noted that Azerbaijan’s economy was devastated when oil dropped from more than $100 a barrel in 2014 to as little as $26 last year. The Azerbaijani currency was devalued by the government and is now worth about half its previous value. The once-booming city skyline is now blighted with half-finished buildings topped by idle cranes. Businesses have shut, and thousands have lost jobs. Karimli said Garant is renegotiating contracts with its builders that are all denominated in dollars. With Azerbaijani currency worth half its old value, that means the price of the Trump project has effectively doubled for Garant. The only key player who has not lost money on the project is Trump. Trump’s deal is not being renegotiated and his fees will not be reduced, said Karimli and Garten, neither of whom would disclose how much Trump was being paid. Garten said the Baku project was hit by economic factors beyond Trump’s control. He said the global recession that started in 2008 forced the cancellation of many other projects — for Trump and for developers throughout the world. Karimli said Mammadov initially wanted to license Trump’s name because it was known among political and business leaders in Azerbaijan, as well as international businessmen who would be attracted to a five-star hotel in Baku.